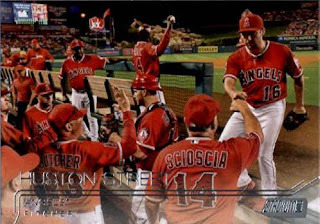 I'd given up on the Angels after the team finished August with the 10-19 record, but with David Murphy's game-winning hit Monday night - the Angels have kept pace with the Astros for the second wild card spot in the American League, just a 1/2 game out. 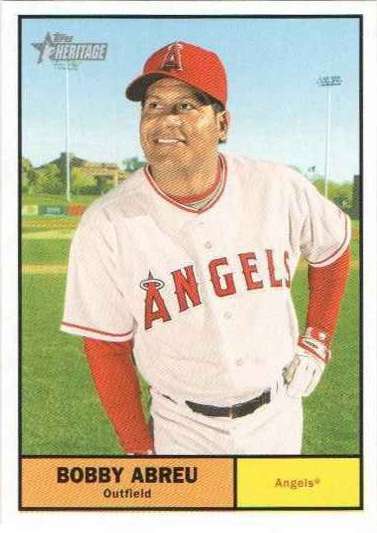 I want to say thank you to Tom at The Angels, In Order blog for a 16-card 'boost' to my frankenset - maybe the project has actually slowed down as I figure out where I'm at, so it's nice to knock out some of the miscellaneous cards I didn't want try too hard to seek out at the moment. Two other cards were not actually frankenset needs - I'll find a spot for them though. 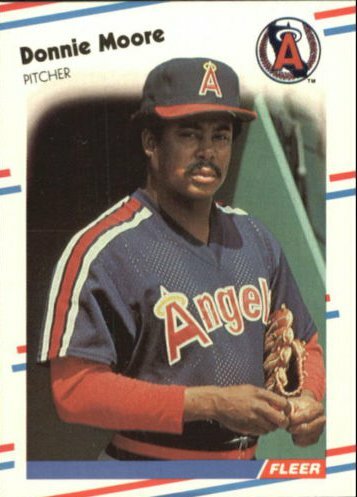 1976 Topps Ed Figueroa #27 - I had a 1976 Topps Figueroa card marked as a 'need,' but looking through my wantlist, the card I needed was a 1975 Topps. I picked up this autograph of the Cardinals pitcher who has had a breakout season as a starter - unfortunately Martinez was pulled after throwing only seven pitches in his last start and his status maybe up in the air. I grabbed this 2014 Newcomb certifed autograph for $3 and while it's just not a Bowman Chrome - I thought it was a nice, shiny card to put away. 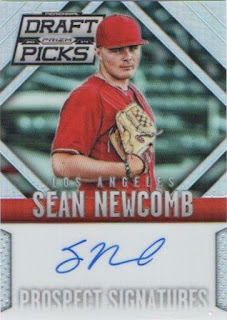 The top pitcher in the Angels minor league system, Newcomb will likely be in the major leagues at some point next season - here is a Baseball America story from 2014 about how he established himself as legitimate draft prospect. I was fortunate enough to get Berra's autograph in-person just a few times over the last 15 years, including this 8x10 glossy picture - may the former New York Yankees great and one of Major League Baseball's iconic characters rest in peace. 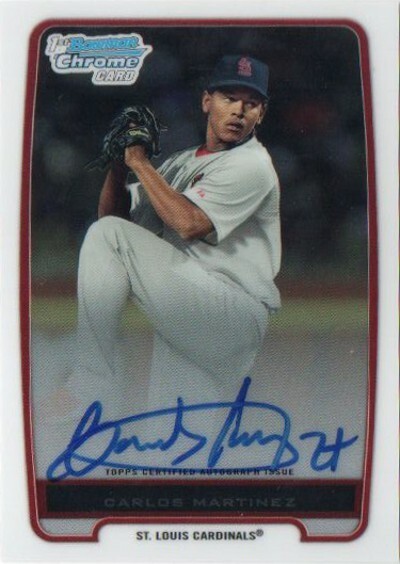 I picked up a trio of certified autographs of the Angels pitching prospect - in his first full professional season spent between two teams, Ellis won 11 games and struck out 132 batters in 140.2 innings. #244 2005 Donruss Zenith Rod Carew - Museum Collection parallel; even though it's not a refractor, I liked how this card shimmered, so I figured why not pick it up for a dollar and change. 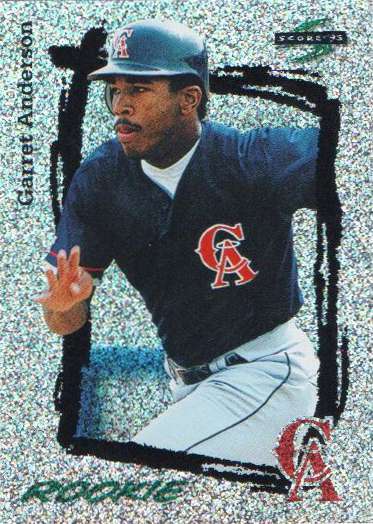 310 1995 Score Platinum Team Set Garret Anderson - I grabbed the Anderson because I hadn't really seen the card before and I like how it pops. 386 2001 Topps Chrome Troy Percival - Retrofractor parallel; the front of the card has a refractor finish while the back of the card has a grayback finish. 450 1992 Leaf Chuck Finley - Black Gold parallel; I've had my share of Finley cards from the junk wax era though I went ahead and grabbed this parallel. When I found out Palmeiro was going to be playing baseball with his son Patrick for the Sugar Land Skeeters - I thought it was a pretty neat opportunity, even if it's only independent league baseball. Maybe it's just a coincidence but as a baseball fan, I've been thinking about Palmeiro lately - it's been 10 years since he got popped for a failed steroid test, tried to come back after a 10-game suspension but finally just got told to go away by his team. 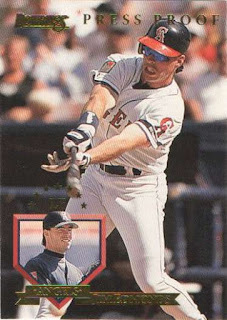 He wasn't a traditional superstar, but Palmeiro did those Viagra ads and was one of those guys who put metronomic numbers - as long as he put up the 'big' stats, there was always some interest in how he was doing, especially around the time he hit his 500th home run back in 2003. 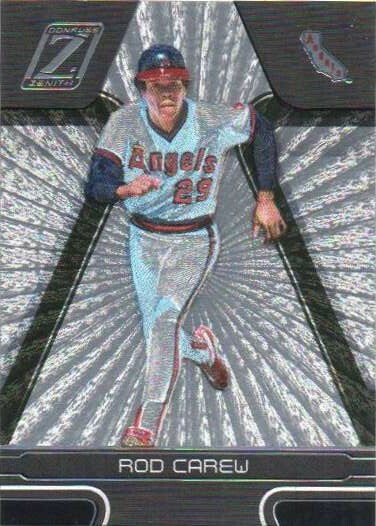 These pick ups aren't for the Angels frankenset, but are a shiny reminders of the trio [Tim Salmon, Jim Edmonds and Garret Anderson] - that starred in the Angels outfield 20 years ago. 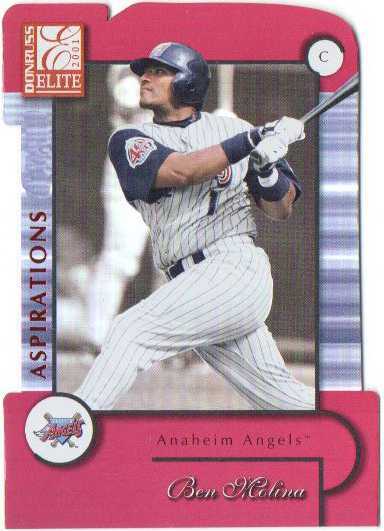 Salmon was probably my favorite player until three or four years ago when another fishy came onto the scene - regardless, Salmon was inducted into the Angels Hall of Fame this year. Edmonds was the flashy guy in center field who had his breakout year with the Angels in 1995 - he might be the borderline Hall of Famer out of the three [for mainly the numbers he put up after being traded to the St. Louis Cardinals]. 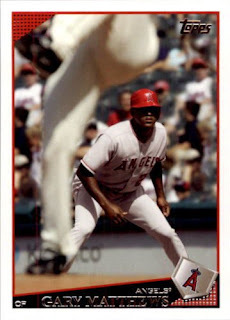 Anderson just went about his business in his own way, not always endearing himself to the fans or the media - despite a relatively low on-base percentage [.324], he put together metronomic hitting numbers and along with Salmon, helped the Angels win the 2002 World Series. I picked up a first-year autograph card of the ace of the Angels pitching staff back when he pitched a two-hit shutout of the Boston Red Sox back in July - I keep thinking back to when the team was in much better shape and how Richards was going to be the main man in the rotation to keep the Angels in the playoff hunt. Though the Angels find themselves likely playing out the string, Richards has actually had a respectable season - especially after coming back from a gruesome injury in 2014. For what it's worth, I only realized I had this other first-year autograph of Richards from this break - maybe after Richard's second or third year with the big league team. I didn't find a single Kris Bryant Topps chrome card in my two blasters - at the moment they do seem plentiful and if I get around to it, see if I can pick one up otherwise. #203 Byron Buxton - apparently this was one of the five rookie cards short prints Topps added to Chrome, not particularly exciting at the moment. Looking to pull a Topps Chrome Kris Bryant base and/or a parallel card to squirrel away - when I found out there was a Topps.com shop 25 percent off promotion during Labor Day weekend, I picked up a couple of 'value boxes' for just under $40 shipped. I don't know if the promotion really did anything to make these blaster boxes that much more of a bargain - but finding particular types of blasters at big box stores can be iffy at times and at the very least, I didn't have to leave the house to get my first fix of this year's Topps Chrome. I was looking up cards for my frankenset and this die-cut Aspirations parallel caught my eye - Molina wasn't quite a franchise star, but he was a homegrown catcher who established himself as an every day player and was part of the Angels 2002 World Series champion team. It's all ancient history but 1990 Leaf was a high end set and while early 1990's collectors / speculators who opened a lot of this product at some point may not have cared - just getting my hands on a random common or two probably would have been a big deal when I only came across the usual Topps, Donruss, Fleer, Score and Upper Deck. I remember Eichhorn as mainly a 'junk wax guy' who had a sidearm delivery, but I wasn't aware of his great rookie season until I read this Baseball Think Factory thread - Eichhorn is mentioned in posts #57-#59 as part of a discussion whether or not a reliever can do enough to merit serious consideration for the MVP. 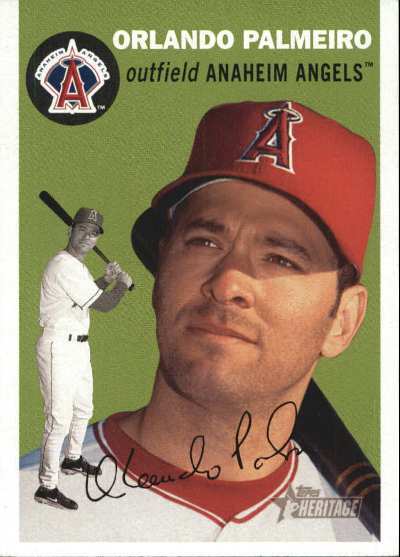 Pitching for the Toronto Blue Jays, Eichhorn outpaced other rookies with a 7.0 WAR - he finished third in the 1986 American League Rookie of the Year race behind Jose Canseco and Wally Joyner. 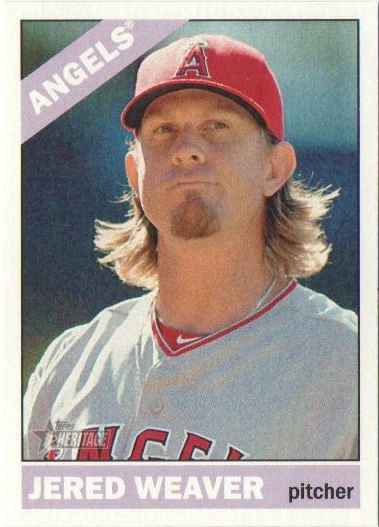 In addition to a 2012 Topps Update Gold parallel [#US157] I already had, this was the second card of Calhoun I was able to add to my frankenset - he's not quite a star, but as an overachieving ginger, Calhoun is a fan favorite among the non-Mike Trout category of current Angels players. 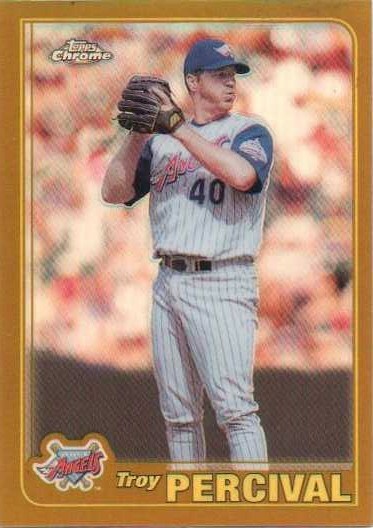 Though Calhoun plays in a different era and for a different organization - he's kind of like Rusty Greer lite. I picked up this 2001 Upper Deck Pros and Prospects Greg Maddux / Randy Johnson #PPMJ for my pitchers hitting mini-collection - when looking at various card pictures online, sometimes I'll find memorabilia / autograph cards that fit my esoteric interests. 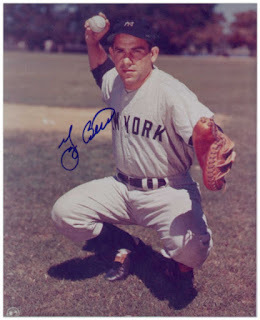 Perhaps it's more of a challenge finding memorabilia / autograph cards with unique images because a card company is just looking to make up a card - that will contain a swatch of memorabilia and/or be autographed. Just 5-10 years ago, I thought memorabilia / autograph cards were still worth something - so I felt I couldn't really pick up the ones that featured a star player or two. 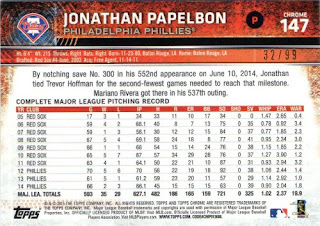 As is, there isn't as much interest in common memorabilia cards and to have some fun - I can add a few of the ones that pique my interest into the back end of random online purchases. I picked this Harper 2013 Home Run Derby subset card up for $0.60 to take note of the 22-year old - who could very well be the 2015 National League MVP [even as his Washington Nationals have been up and down at best]. I don't keep up with his numbers on a game-to-game basis, but he is putting up some monster numbers - while he hasn't hit as many home runs in the second half, Harper's on-base and slugging percentages are still well north of .400/.600. 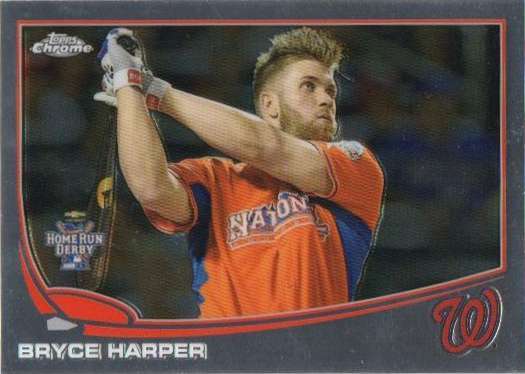 Having played in the MLB for the last four years, Harper's basic cards are a dime a dozen - while this one is just another miscellaneous card to be put away, it might be the card I save for my award winners collection if Harper is awarded the NL MVP. Several weeks into my Angels frankenset project I didn't know if I was going to find this oddball card - but a listing showed up online, I placed a bid and waited it out. It may have been an overpay but I thought I was glad to win the auction - an alternative may have been looking for the back issue where this card [as part of a nine-card sheet] was inserted. 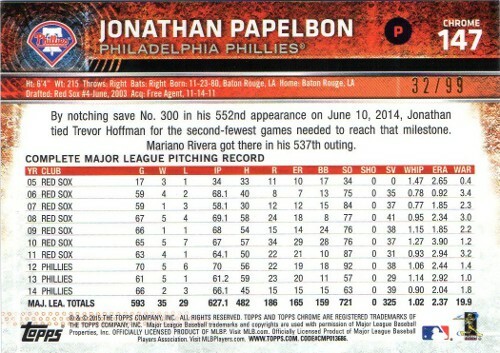 However, I finally got the card in-hand and all I can say was that it's barely a card - I'm not unfamiliar with the SI for Kids magazine inserts from the last 20-25 years, but it's a long time since I've had one in-hand and I didn't realize how thin the cardstock was. 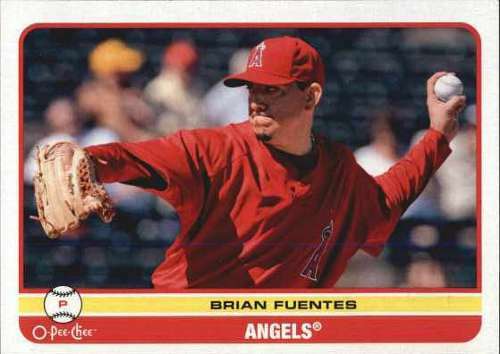 All my Angels frankenset cards are stored in a penny sleeve and then boxed up - I inserted a dummy filler card with the Guerrero card, so it doesn't feel so flimsy all by itself. 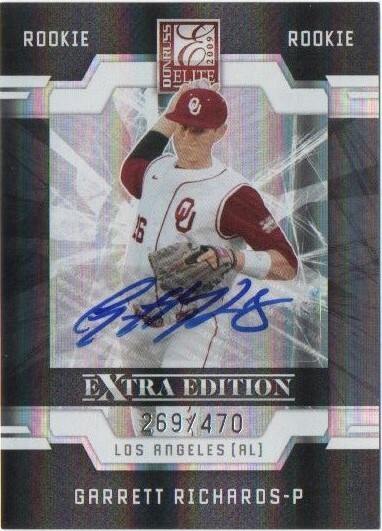 I picked up a 2013 Bowman Inception certified autograph of the Pittsburgh Pirates outfielder because he might be a future star - Polanco was slow to put things together in the first half of the season, hitting only .237 with a lowly on-base percentage [.315] and an equally subpar slugging percentage [.338]. While still a work in progress, Polanco started to finally put up numbers at the plate during the past two months [especially in August] - with still about a month in the 2015 MLB regular season left, hopefully Polanco can build upon the ups and downs of his year and be a better baseball player in 2016. 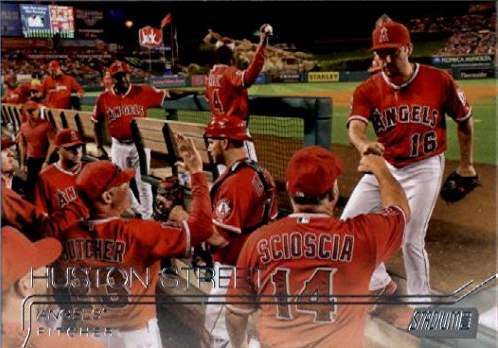 If I already had a card for a particular number in my Angels frankenset, I wasn't going to seek out a new card that I'd have to pick up, but there are random exceptions - I added a 2015 Topps Stadium Club Huston Street [card #4] for my project since the image used of the Angels closer coming into the dugout getting a fist bump from manager Mike Scioscia wasn't typical for a baseball card. 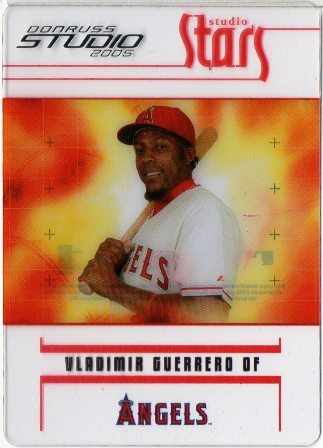 The card that the Street replaced was a 2005 Donruss Studio Stars Vladimir Guerrero insert [card #S-4] - while the clear cut Guerrero card is unique, it is otherwise bumped back down into the random collection of Angels inserts I'm trying to put together. Another 2015 Topps Stadium Club I had to get into my frankenset was C.J. 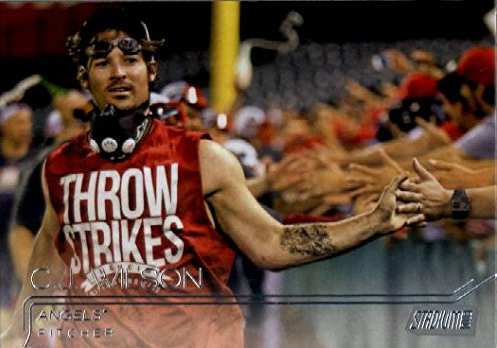 Wilson's [card #163] - the picture used is a candid image of Wilson going around Angel Stadium celebrating with fans after the Angels won the American League West in 2014. 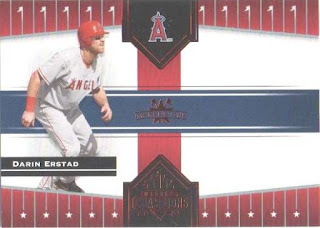 The card that the Wilson replaced was a 2011 Topps Lineage Jered Weaver Diamond Anniversary parallel [card #163] - the Weaver is shinier but the picture is pretty boring, so it shares the same fate as the Guerrero card.